A I told you, I decided I had to quilt around the appliqué of the wall hanging. The red and black parts were easy. I was able to quilt on the background around the appliqué but the central medallion was more of a challenge. I did quilt around it on the background but I knew I had to do at least some on the appliqué itself. The trouble was I didn’t have any quilting thread that was the right colour. 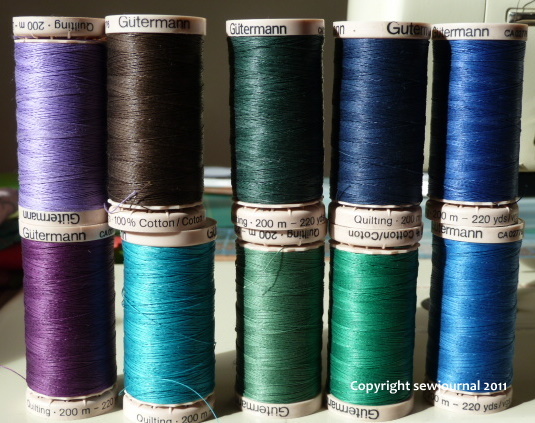 I headed off to the LQS and found they were holding a clearance sale on Guterman hand quilting threads. They’re not going to stock them any more and so were selling them for $2 a reel. Looks like I was in the right place at the right time! What’s more they had the exact colour I needed so I bought it and nine other reels. Aren’t the colours pretty? Very pretty, rich colors. You were indeed in the right place at the right time! I can’t wait to see the finished wallhanging. Lucky you !!! The colors are beautiful !!! !